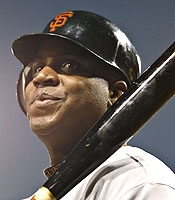 FEBRUARY 29--A federal judge today ordered the unsealing of the transcript of Barry Bonds's December 2003 testimony before a San Francisco grand jury, an appearance that resulted in the baseball star's indictment last year on perjury and obstruction of justice charges. The 149-page Bonds grand jury transcript, which U.S. District Court Judge Susan Illston ordered released, can be downloaded here (PDF file). The unsealing order came following a court hearing during which Illston cited deficiencies in the Bonds indictment and directed prosecutors to either redraft the document or head back into a grand jury to seek a new indictment.